Tom Sutko spent three decades in leadership roles with a Fortune 500 company. The years taught him a lot about management and operations. When his position was eliminated four years ago he went searching for new opportunities and franchising topped the list. His due diligence led him to AmeriSpec, the home inspection service franchise that works with homebuyers, sellers, and real estate professionals. Sutko says he loves his new career and his results have shown it. He has been racking up the awards, including finishing 2013 as the system's top franchisee. He's also active within his community and makes philanthropy a major part of his operations. Here's more of what we found out about Sutko. Family: wife (Melanie-33 years married), son John (28), son Paul (26) who works in the business. VP/GM position eliminated after spending 29 years with a Fortune 500 manufacturing company. Worked with a franchise coach out of Tulsa, OK. Pursued three franchise opportunities, visiting two Discovery Days. Our measure of success is to grow the business faster than what the market has grown. In the four years of being the owner, we have exceeded the market growth of our two markets. Achieving the Marion E Wade Award after just two years in the business. 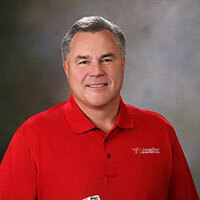 Finishing number one franchise for AmeriSpec in 2013, beating the other 32 by more than 20 percent. I'm second-guessing myself on purchasing a pest control company to leverage our existing clients. Hands on, highly engaged in the business. I'd say I spend 50 percent on the business and 50 percent in it. It should be 20 percent in it and 80 percent on it. Growing the business, being a very successful business owner. Being an owner affords me some flexibility to take periodic trips during the slower times of the year. Heavily involved in mentoring/working with my two sons as they get their careers established. Our "value proposition" states who we are: we bring a higher level of professionalism to the industry, one that is focused on "adding value" while "reducing the risk" of a home inspection while "partnering" with realtors by providing products and services unlike any other inspection company in the state. Providing an affordable healthcare option for my employees. Growing the business given the shortage of homes on the market. FYI, in our market, there were 30 percent less homes for sale in December of 2013 than December of 2012. It will definitely be a challenge to exceed our revenue numbers in 2014. An operating system that enables us to differentiate our services and business opportunities that materialize. Are you involved in any charitable organizations or causes? Most definitely, it's a part of our partnering efforts with the realtors. We support a variety of realtor-initiated programs. Most large events, we develop a plan to raise monies for the event, then match the funds. In addition, we give away (3) $1,500 "Future Leaders Scholarships" to high school seniors of the realtor community we serve each year. Coming up this summer, we will present our 13th, 14th, and 15th scholarships. To date, we have given away 12 scholarships worth $18,000. We also host a sand volleyball challenge each summer for the realtor offices in Lincoln. The winning team gets $750 donated to their charity of choice. It's early, but we are actively pursuing this vehicle to stay in touch with our customers. I believe in establishing annual performance priorities and measuring their results (each objective needs to be measureable - black/white). I'm a big believer in making sure my employees have the tools to do their job, and to take care of our customers. In the event there are issues, we encourage them to strive to be better and get them additional training to be successful. Continue to take market share with our home inspection business.